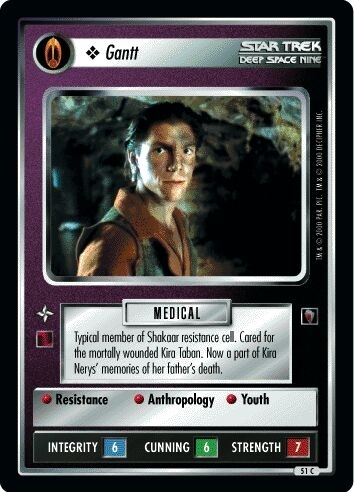 Characteristics: "Reshape the Quadrant"-related cards, affiliation, "Shakaar Resistance Cell"-related personnel, Resistance, Bajoran species. There are 19 entries for Gantt (ST1E 11 C 51) at the Tradeplace (65 haves and 2 wants). Click here to see all trade list entries for this Common card!